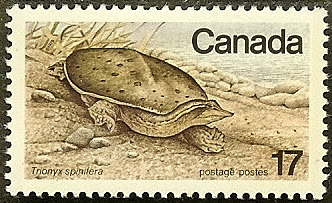 10c 17 Sep 76 Chelydra serpentina This stamp depicts an Indian rattle made from a snapping turtle shell. 17c 24 Apr 81 Stylized Turtle The turtle is small and in the upper right corner of the stamp. Main design is sculpture of Kateri Tekakwitha ("Lily of the Mohawks") by Emile Brunet. SC 2229 52c 01 Oct 07 Dermochelys coriacea Sheet of four endangered species plus four labels, including a right whale, a northern cricket frog, a leatherback turtle and a white sturgeon. Turtle on one stamp and one label. SC 2229 d 52c 01 Oct 07 Dermochelys coriacea Single stamp w/ turtle from Scott Canada #2229. Inscribed "Leatherback Turtle" and "Tortue Luth". 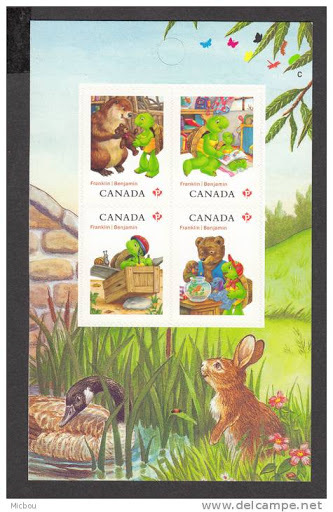 SC 2233 52c 01 Oct 07 Dermochelys coriacea Single self-adhesive, die-cut stamp from booklet w/ design identical to Scott Canada #2229d. 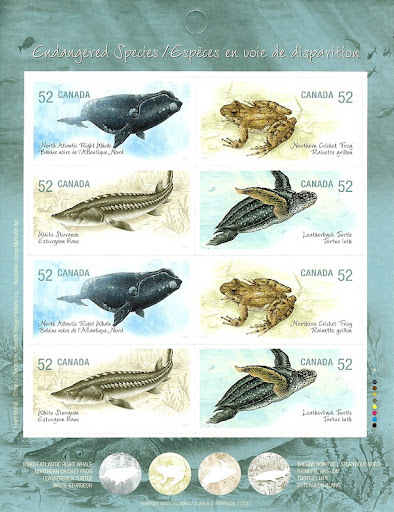 SC 2233 a 52c 01 Oct 07 Dermochelys coriacea Block of four stamps from booklet. 52c 01 Oct 07 Dermochelys coriacea Booklet pane consisting of two Scott Canada #2233a. 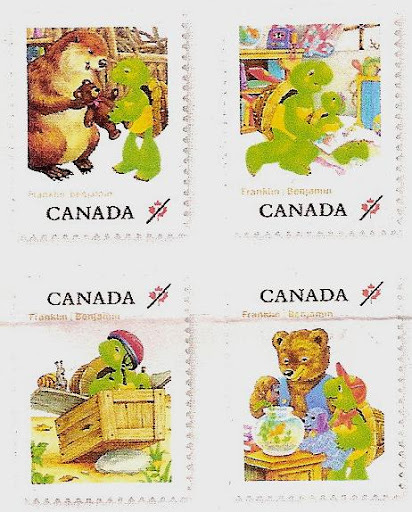 61c 11 May 12 Cartoon Turtle S/S of four stamps, each w/ a scene featuring Franklin, a cartoon turtle featured in popular Canadian children's books (in the French language versions of the books, Franklin is known as Benjamin). 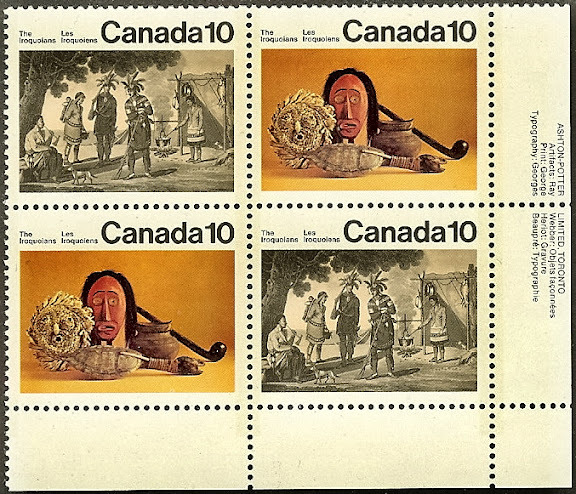 A booklet of 12 stamps was also issued, featuring the same four stamps that are on the s/s. 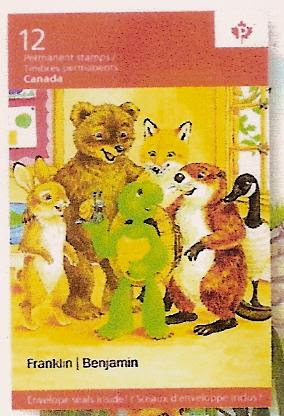 SC 2541 a 61c 11 May 12 Cartoon Turtle Franklin the Turtle and a beaver holding a teddy bear. One of the stamps on the sheet of four. SC 2541 b 61c 11 May 12 Cartoon Turtle Franklin the Turtle holding a baby turtle. One of the stamps on the sheet of four. SC 2541 c 61c 11 May 12 Cartoon Turtle Franklin the Turtle and a snail in a toy airplane made from a wooden crate. One of the stamps on the sheet of four. SC 2541 d 61c 11 May 12 Cartoon Turtle Franklin the Turtle, a bear and a dog feeding a goldfish in a bowl. 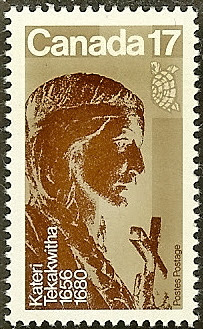 One of the stamps on the sheet of four.